The marketing and promotion opportunities for an online business continue to grow because of the web. Heck, forget about growing… opportunities are scaling to unprecedented levels. I’ve written before about how if you have a local business, you should be using a Facebook Fan Page along with a Google Places profile for your business. Well let me take this one step further with the new Facebook Places. Facebook Places is simple amazing for any local business, product, or service to be leveraging. Facebook Places utilized the new Places feature on Facebook mobile phone apps. If you have an iPhone, make sure you upgrade your Facebook app to the newest version to get the full experience of Facebook Places. Anyway, Facebook Places is a feature that allows you to “check in” to local establishments. 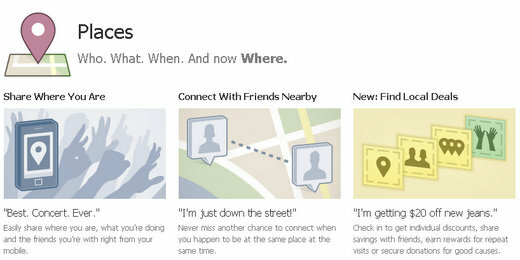 This “check in” process through your Facebook mobile app lets your friends know where you are. But also when you “check in” to places, like Starbucks for example, you have the opportunity to see promotions from Starbucks. Let’s say I owned a pizza shop in Athens, Georgia called Pizza Time. I would be able to claim “Pizza Time” as my business, and the restaurant would viewable to anyone on a mobile device who is logged into Facebook and in close proximity your restaurant. * Note – if you’re thinking, “that doesn’t sound like a big deal”, then how about the fact that 200 million users now access Facebook through a mobile device? The really cool thing with Facebook places is not only can you connect to people who are close by your store, but you can also add coupons, sale offers, or some other incentive for mobile Facebook users to come on in your store. For example, you can offer 10% off to anyone who comes into your store and shows you they saw your business Places profile on Facebook. I just heard about a restaurant in Atlanta that ran a promotion via their Facebook places profile of $20 off if you showed them their coupon on your mobile phone. This promotion was so effective that a line was going down the sidewalk and people were leaving because of how long it would take to get in. Perhaps one of the coolest features of Facebook Places is the fact that it integrates directly into your Facebook Fan Page. This means that if you’re a local business with a Facebook Fan Page, then your Places profile will integrate directly into your Page. Now when people visit your Facebook Fan Page they will actually see a Google Maps location of your business. You can learn more about Facebook Places here.